What happens when some of the coolest children’s book authors and illustrators play a writing game that starts with one person’s ideas and ends with a novel of 27 episodes? You get The Exquisite Corpse Adventure. The title makes it sound like it should be a horror story, but it’s actually a weird, crazy, funny, out-of-control story put together by some of the coolest authors around. If you’ve read or participated in the FaBo story that Kyle Mewburn started, The Exquisite Corpse is the same idea. 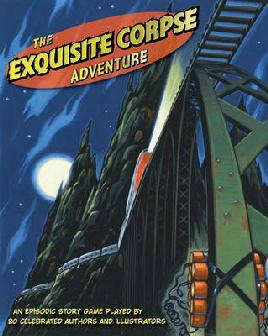 Pick up The Exquisite Corpse Adventure if you dare and be prepared to be taken on a wild ride.